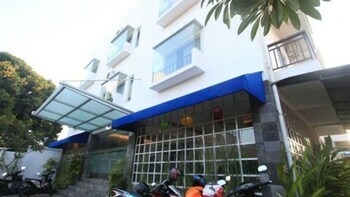 Located in Tuban, The Airport Kuta Hotel & Residences is within a 15-minute drive of Kuta Beach and Tuban Beach. Featured amenities include dry cleaning/laundry services, a 24-hour front desk, and luggage storage. Free self parking is available onsite. With a stay at Airy Sanur Bypass Ngurah Rai 500 Bali in Sanur, you'll be within a 10-minute drive of Sanur Beach and Sanur Night Market. With a stay at ZEN Rooms S Resorts Hidden Valley Bali in Pecatu (Kuta Selatan), you'll be within a 15-minute drive of Nyang Nyang Beach and New Kuta Golf. Free self parking is available onsite.